I made Moroccan Meatloaf using this recipe from My Gourmet Connection and adapted it to use available ingredients. I was a bit skeptical while cooking but the end result was very satisfying. The meatloaf turned out to be juicy, succulent and reasonably healthy (owing to very little oil used). Meatloaf is a dish of ground meat mixed with other ingredients, formed into a loaf shape, then baked or smoked. The loaf shape is formed by either cooking it in a loaf pan, or forming it by hand on a flat baking pan.Meatloaf is usually made from ground beef, although lamb, pork, veal, venison, and poultry are also used. The meatloaf has European origins; meatloaf of minced meat was mentioned in the famous Roman cookery collection Apicius as early as the 5th century. Meatloaf is a traditional German and Belgian dish, and it is a cousin to the Dutch meatball. American meatloaf has its origins in scrapple, a mixture of ground pork and cornmeal served by German-Americans in Pennsylvania since Colonial times. However, meatloaf in the contemporary American sense did not appear in cookbooks until the late 19th century. Heat the olive oil in a large pan over medium heat. Add the garlic and the onion and sauté until soft and fragrant, about 2 minutes. Remove from the heat and allow to cool. Add the roasted walnuts and almonds to this mixture. In a large bowl, add the mince, beaten egg, bread crumbs, cumin, cinnamon, red chilli powder, salt, black pepper yoghurt and celery. Add the cooled onion, garlic and nuts mixture. Mix thoroughly and form into an oval loaf that will fit your baking dish. Transfer this prepared loaf into the baking dish and bake for about 30 minutes. While the meatloaf in in the oven, make the tomato dip by mixing the precooked tomatoes, yoghurt, garlic, cumin, cinnamon, red chilli powder, lemon juice and sauce in a blender or food chopper. Keep the blender running till the sauce is smooth. Remove the meatloaf from the oven and burn the top using a butane torch. (for not more than 30 seconds or you will have charred meat). Allow the meatloaf to rest and cool down for about 10 minutes before slicing and serving. 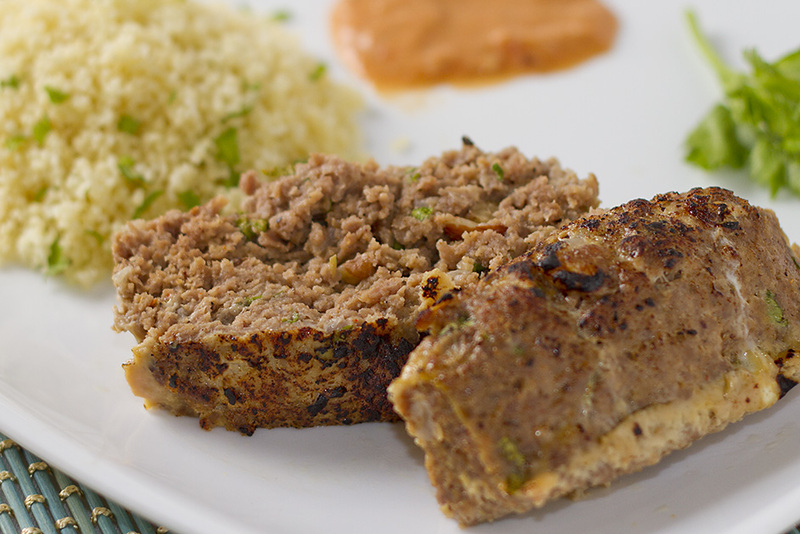 Serve this Moroccan meatloaf with couscous and dipping sauce. You can also substitute the couscous with potatoes.